This soup is called gear’s soup or “engranes” in Spanish, but growing up we called “sopa de rueditas” or wheel soup because its shape resembles little wheels. This pasta soup is one that you can prepare as a main dish or as a part of a full course meal. 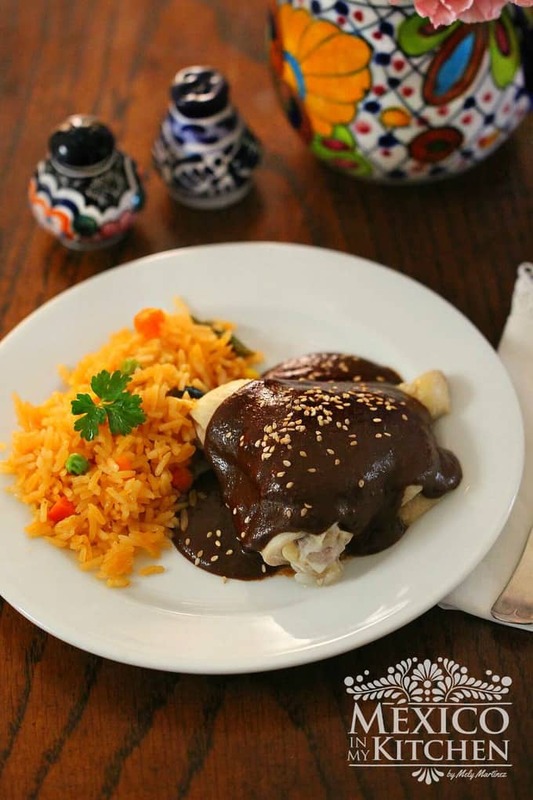 You can even make it a day ahead and take it with you to work or just warm up when you come back for dinner, it tastes even better the next day. This soup takes me back to my elementary school years when coming back from school, sometimes, I will stop by one of my uncle’s house just to see what they were for having lunch and, hopefully, get invited. 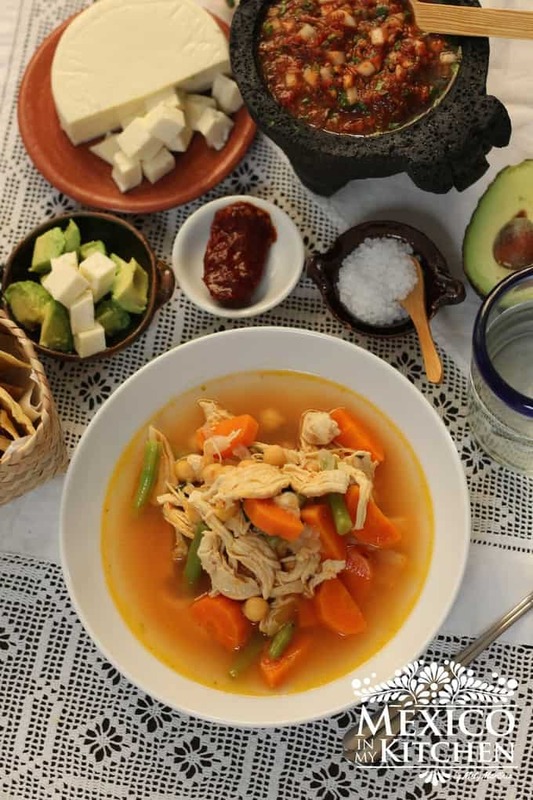 My aunt lived with one of my cousins, and she used to make this soup and, as many people do in Mexico, she added a few drops of lime to their soup, plus something else that was weird to me at that time, shredded raw cabbage. 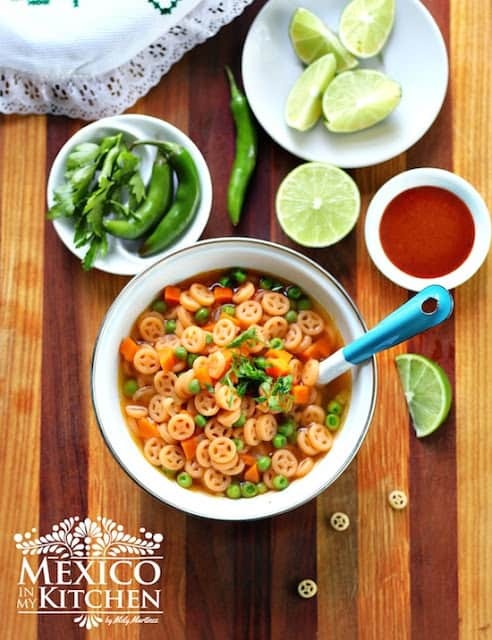 Look for veggies in your fridge and freezer and enjoy this soup with the toppings of your choice. Pour the water and add the Knorr tomato bouillon, stir until it has dissolved. Cover the saucepan, and simmer for 10 minutes. Stir in the green peas and turn off the heat, place the lid back. After 3 minutes it is ready to serve. Ladle into cups or bowls, and garnish with cilantro or parsley. If you like to add some toppings check the notes above, I like to add a little bit of bottled hot sauce and some crumbled Mexican fresh white cheese. This soup is called gear’s soup or “engranes” in Spanish, but growing up we called “sopa de rueditas” or wheel soup because its shape resembles little wheels. This pasta soup is one that you can prepare as a main dish or as a part of a full course meal. Heat the oil in a large saucepan, over medium heat. Add the carrot, onion, and garlic, and cook for about 5 minutes, stir in the pasta and keep cooking for 3 more minutes. This soup makes about 4 1/2 cups of soup. *This is only half of a regular Mexican pasta package of 7oz. You can substitute for another type of pasta. Some classic toppings are diced avocados, crumbled queso fresco, and finely chopped Serrano peppers. What a nice and simple recipe! Thank you, Mely! Do you think it would be good with some broth or stock instead of water? Yes, you can add chicken broth. Hola Mely, yo soy mexicana y vivo en Francia. 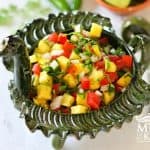 Así como tú tengo un blog de cocina y otras cosas mexicanas. Voy a tratar de conseguir la pasta de rueditas de tu receta a ver si la encuentro, no es muy seguro porque aquí no consigo muchas cosas de México. Saludos!